Poll: Do you think Maharshi has a flavor of Srimanthudu? నాకు చాలా బాధగా వుంది కానీ తప్పలేదు – నిఖిల్ ! The Akkineni family is going to be seen together in the multi-starrer project, ‘Manam’. The movie is currently being shot in Annapurna Studios and shooting is going on at a good pace. 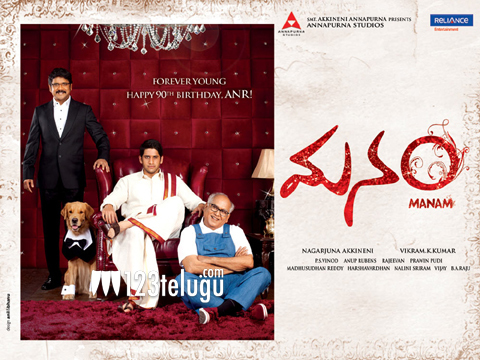 The film’s first look was released a few weeks ago, on the occasion of ANR’s birthday and the general public curiosity about the project has increased after that. As per the industry grapevine, Nagarjuna will be seen as the son of Naga Chaitanya and Samantha, while ANR will be seen as the son of Nagarjuna and Shriya in the film. The movie is said to contain a very interesting screenplay. Vikram Kumar is directing this movie and Harshavardhan is penning the dialogues. Anoop Rubens is scoring the music. Nagarjuna is producing this film on Annapurna Studios banner, in association with Reliance Entertainments.